855 Carriage Way Leaf 703, Snowmass Village, CO 81615 (MLS #158385) :: McKinley Real Estate Sales, Inc.
Top floor. Top shelf. Top of the Village. 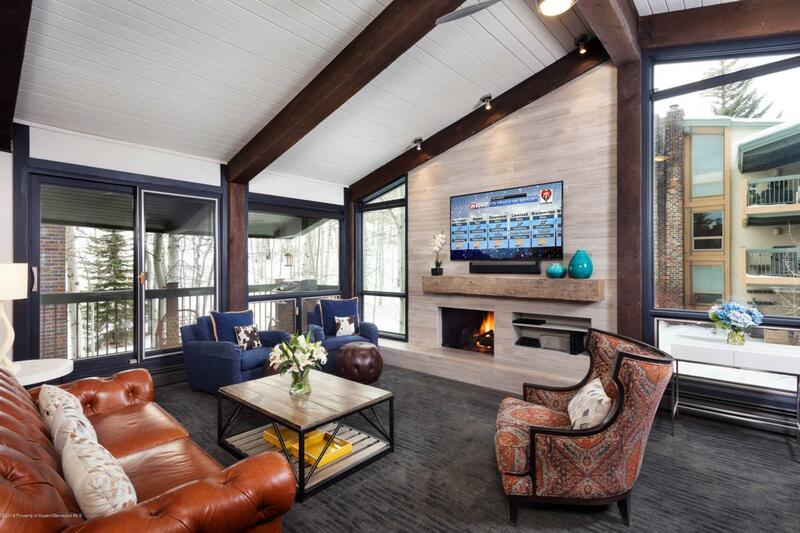 Completely renovated in 2015, this stunning mountain modern designed condominium features floor to vaulted ceilings windows that look out to Dawdler ski run and up to the Big Burn through an alpine Aspen grove. Finishes include chenille white vein-cut limestone fireplace surround. A new kitchen was added with stainless appliances and quartz counters. The guest bedroom sleeps four as in-wall bunks were added. Ski-in/out. Beautiful outdoor heated pool and hot-tub area. Assigned carport. Owner's allowed pets.